Note 4: You must have your sprx files already in place, All this does is swap the txt files to allow for easy switching of the enabled plugins. Note 5: If you want more or less "slots" you can edit the xmls quite easily. Maybe someday we will be able to use a different system plugin for file manipulation, that way mods like this could be made webMAN Mod independent and Cobra independent, Also it would speed things up as the browser slows it down and makes it a bit clunky, would be nice and clean if it could use another plugin. Here is a quick video demo showing how it works. 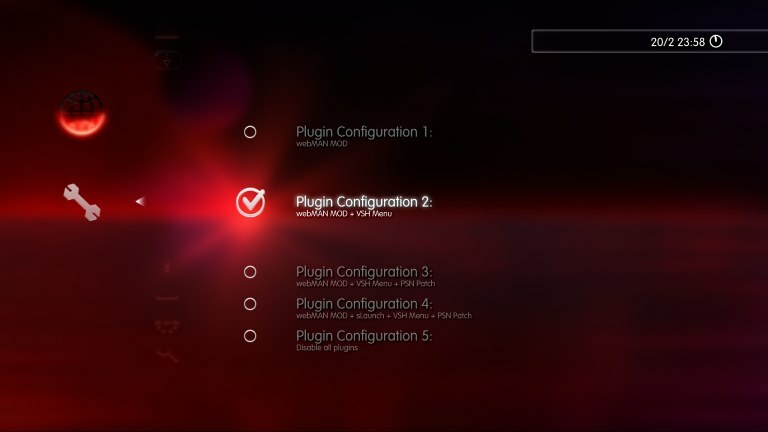 When you select your desired configuration the PS3 will reboot almost instantly with your new boot_plugins.txt/xRegistry.sys file active. citra mulia, Metalomeus, aldostools and 1 other person like this.